Ebrary is a database containing more than 80,000 ebooks (online books) in all subject areas. 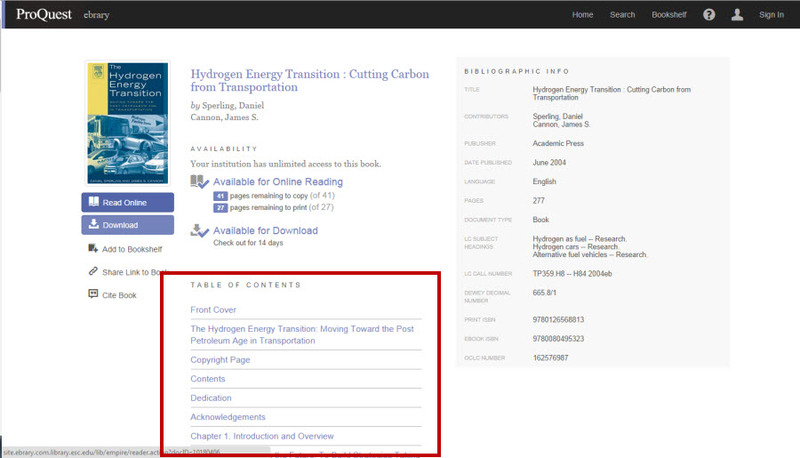 Ebrary ebooks are included in the library's Ebook Catalog. You can look them up there and click View Ebook to read them. 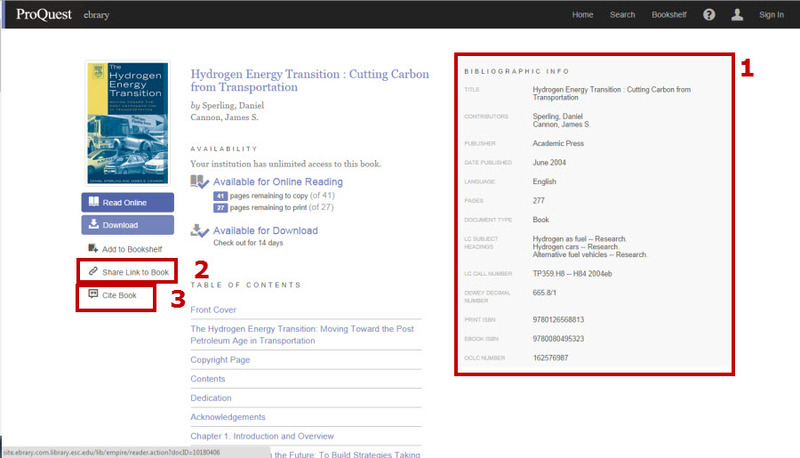 Many people prefer to search Ebrary's own database because then you can search the full-text of the books. If you are unfamiliar with accessing the college's research databases or entering your college login, review How To Access Library Databases. Go to the library homepage at www.esc.edu/library. Below the Ebook Catalog search box, in the alphabetical list of ebook databases, click ebrary. The Simple Search box is at the top of the ebrary homepage. Use keywords to search the full text of all the e-books in ebrary. If your keyword appears anywhere within the full text of a book, it will be returned in your results. Put quotation marks around a phrase so that ebrary knows to search those words as one unit rather than separately. Use AND between keywords to search for books containing both terms. Use OR between keywords to search for books containing either term. For more information, see Using AND, OR & NOT to Combine Keywords. To get to Advanced Search, click the link for it, which is to the right of the Simple Search box. To the left of the search box, select the type of search you want to do - author, title, etc. Subject means searching with controlled vocabulary. For more information about that, see Controlled Vocabulary. Click the All Subjects link to the right of the Simple Search box. 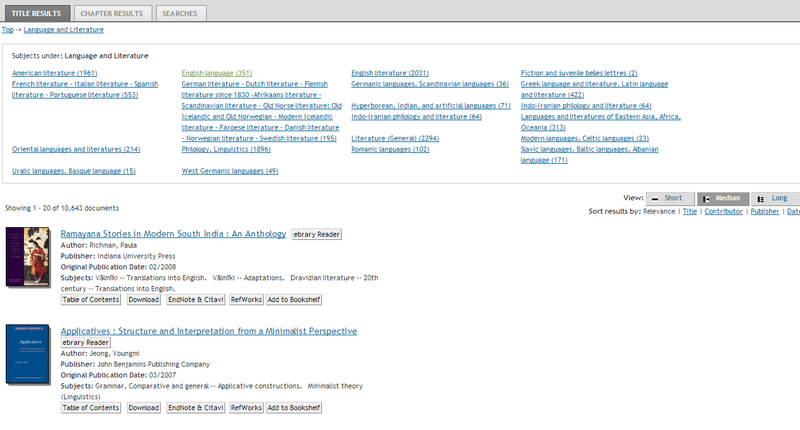 Click a broad subject, such as Language and Literature. 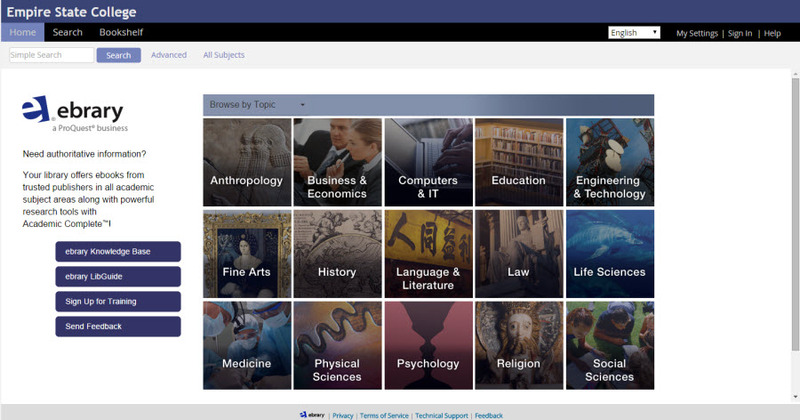 It will take you to a page showing that subject's sub-topics. Click any one of the sub-topics, such as English Language. It will take you to pages of search results for that sub-sub-topic. The results list contains several useful features and options. Download the work or parts of it (only possible if you are logged into your Ebrary account). Add it to your Bookshelf (only possible if you are logged into your Ebrary account). Some ebrary books can be read by unlimited numbers of people. Others can only be read by one user at a time. That information will be given under Availability. This page will also give you some information about the book. Title, contributors (authors or editors,) publisher, publication date, language, number of pages, etc. 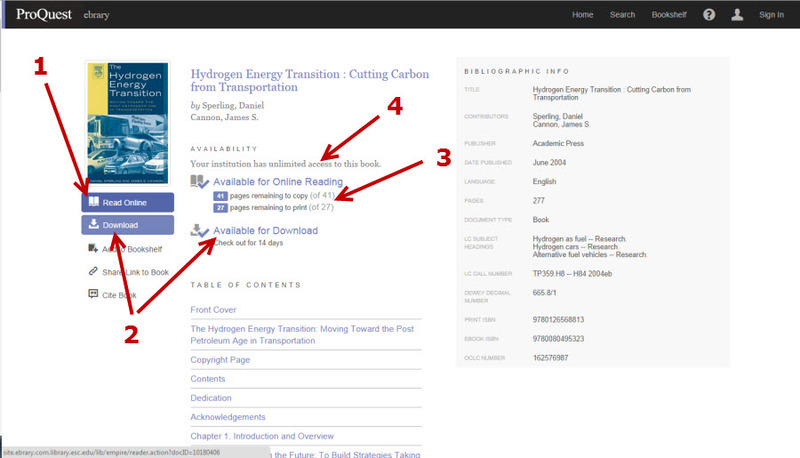 Click the Cite Book button to get a MLA, APA, or Chicago formatted citation. At the bottom of the center section of the page are links to the different sections of the book. Click on one of them to start reading the book. Once you've clicked on one of those content links, you're in the book itself. There are forward and back arrows above the ebook content, for turning the pages. The Table of Contents is on the left side of the window. You can click any chapter to go to its first page. You may have to scroll down the Table of Contents to see all of it.